In these last days, are you spiritually tired or weary? Does condemnation’s voice of “why bother,” frequently visit you? Do spiritual things appear “dull” to you? 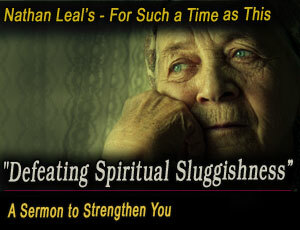 If so, then you many be suffering from spiritual sluggishness; but sluggishness is not the plan that God has for you. In this message, we visit talk about this ailment and what to do about it.